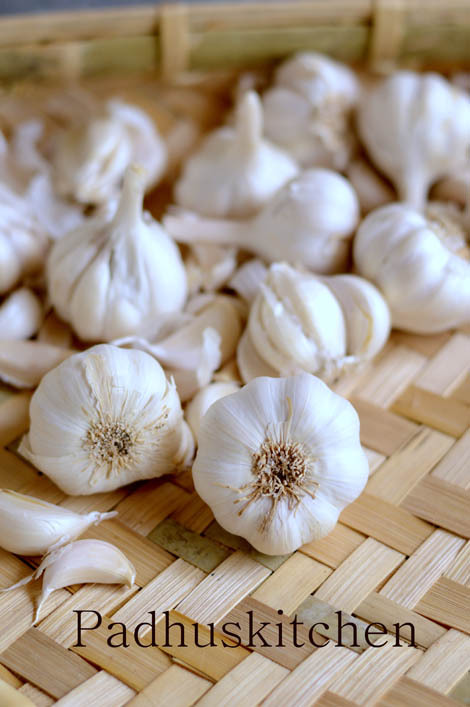 We all know that garlic is good for health and we should include it in our diet regularly to enjoy its numerous health benefits, but peeling garlic is so time consuming and many avoid it because of that. Some people even hate to peel garlic. Peeling garlic is not so difficult as many think. Here are few easy ways to peel garlic. 1.First slightly cut of the root end of the garlic clove. 2.Then using a metal vessel, press the garlic pod applying a little pressure. The cloves will separate as seen in the picture below. 3.Hold a chefs knife or a thick wooden ladle (ladle should not bend) on the garlic clove and with the heel of the other hand, apply slight pressure on the ladle or knife against the garlic clove. (see picture below). This will loosen the skin of the garlic and you can peel it off easily. If you apply too much pressure, the garlic will get crushed. Put 3-4 cloves in a metal bowl. Place another smaller metal bowl inside the 1st metal bowl which has garlic cloves. Apply pressure on the inner bowl pressing it slightly against the garlic clove. The skin of the garlic cloves will loosen and you can peel it off easily. If possible, dry the garlic in the sun for 15-20 minutes before following the above 2 methods. This makes the job even more easier. Very useful post to peel off garlic. very useful tips madam. Thank you. very handy tip, Padhu !